The young, the old and the lonely, part 2: 'Babble and Bubbles' at St. Joe's. After two years of trying and failing to set up a regular intergenerational social, I was delighted when Charley Allen, Activities Coordinator of St. Joseph's Care Home, Tring, commented on my post in the local Facebook group: a desperate last chance to team up stay at home parents, their little ones and isolated older adults. The idea came from my often lonely and anxious experience of early motherhood. The major trial of leaving the house with a tiny baby was always rewarded by a natter in the shops or on a park bench, cooing into the pram, telling me "he's gorgeous". His lovely little face brought so much joy. Surely we could make this a regular thing? Charley works with older adults in a local care home, specialising in dementia care. She was excited by the possibility of opening the care home doors to babies, toddlers and their parents. 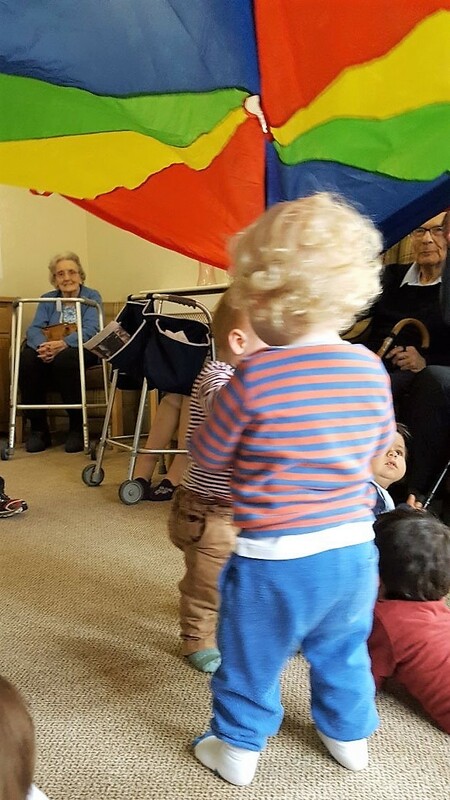 We chatted about what might appeal to both under 5s and over 75s, deciding on traditional nursery rhymes, a story, bubbles, a parachute, tea, biscuits and a chance to chat. We also acknowledged that we'd be joining together the most vulnerable and unpredictable of our community. I remembered my own Grandfather in his last months, lost inside his memory, suffering with the rapidly advancing effects of dementia. It seemed as though he didn't recognise me as his granddaughter, but spoke to me as though he was a boy, and we were childhood friends. His inner child was released: we sang, smiled and joked. My earlier memories of care homes are very clear, the oppressive hush and forlorn expressions, but I don't ever remember seeing other children. According to national statistics, 60% of residents never receive a visitor: a crushing reality that affects physical and mental health. I do remember being quite little and walking past lots of faces, whose eyes would appeal to me and would sometimes beckon me over to talk. My parents always encouraged me to talk to everyone, but it was clear that one little girl wasn't enough. Now, in our 'Babble and Bubbles' group, some grandchildren of the residents come along, bringing much joy and excitement. The once daunting silence has been replaced by the welcoming harmony of different generations giggling together. This project is important to me personally, but it is far more important for our community: residents, staff, parents and children. Mixing generations is important to learn so much from each other. Finding mutual interests and songs to sing would be an important first step to break the ice, ease us all into the shared space and to begin to build friendships between our eldest and youngest. Our first objective was simply to spread a little happiness; a longer goal would be to inspire long-lasting relationships; improve mental and physical health; perhaps even extend life expectancy. We had our first session in the spring. We were probably all a bit nervous and unsure of the new situation. We sang some nursery rhymes and shared a story, but it was the babies and bubbles that stole the show. As the little ones reached for and cheered at the bubbles, some of the older adults really perked up and seemed to enjoy the spectacle of these tiny humans delighting in something so simple. One lady started to sing "I'm forever blowing bubbles..." and it caught on until everyone was singing along. It was a wonderful success; the residents were soon asking: "when are the children are coming again?" By the summer, the little ones were desperate to be outside and the effect of their energy was incredible. Charley had said that it takes a heat wave to get the residents outside, but once the children had made a run for the garden door, the older adults soon followed, disregarding the grey skies. Gingerly, but with determination, walking frames clattered on concrete and more outside seating was arranged. One lady brought her walking frame onto the grass and started to kick a ball about with the toddlers. A crowd of children then gathered around a little worm, attracting some of the older adults to come and see what they were looking at. The fresh air and infant joy were our only medicine, but it was enough to revive us all. Now it's autumn and we've started to try out some arts and crafts: potato prints, finger paints and even rolling pastry for mince pies. It's good to get us all chatting while drawing or moulding. Our interaction has increased and we feel we're starting to get to know each other. Like other parents who attend, I look forward to conversations with our new friends, usually about our shared experiences of parenthood, or childhood memories. Now we've been attending the playgroup in the care home for some time, my same "gorgeous" baby is now three years old and holds his own conversations with the residents, chattering away about their favourite animals or colours. One lady keeps his dinosaur drawings on her room wall. It's brilliant to see that there are projects all over world where different generations socialise and spread so much joy. It's exciting to be a small part of this great shift in how we care for and interact with our most vulnerable members of the community, young and old. Despite the growing interest, we are careful to limit numbers, keep continuity, focus on building relationships rather than numbers and to respect the space where we socialise. Charley ensures that the residents feel safe and are not overwhelmed. Despite the freezing weather, the sessions end with the children running around in the care home's usually silent garden; the residents often watch and laugh from the warmth of the conservatory. These little humans, with wide eyed curiosity and spirited courage, have the power to release unmeasurable joy. Now it's the turn of every manager and care home owner to realise these benefits and to open the care home doors to the babies, babble and bubbles. You can read more uplifting and raw words on Rebecca's blog, The Mum on the Moon: the Night Feed. it is great post about "THE YOUNG, THE OLD AND THE LONELY, PART 2: 'BABBLE AND BUBBLES' AT ST. JOE'S." When I first became a mum, the biggest surprise was how lonely the day-to-day could be. Sanity was usually saved by elderly folk, who were also out getting fresh air in the middle of the day. They had time to chat and stories to share. The baby in my arms was proof enough that I was harmless. His tiny presence made opening lines easy enough; conversation flowed freely between strangers, bridging generations, differences and histories. A park bench or check out queue became therapeutic moments in the day, cooing over little one's eyelashes, or sharing ad hoc games of peekaboo. They were brief chance encounters but spread so much joy.